The Atlantic puffin and denomination 200. Watermark is made after photo by Tom Schandy. About Atlantic puffin, please, read obverse description. The motive for all banknotes of the new series was the theme "The Sea". 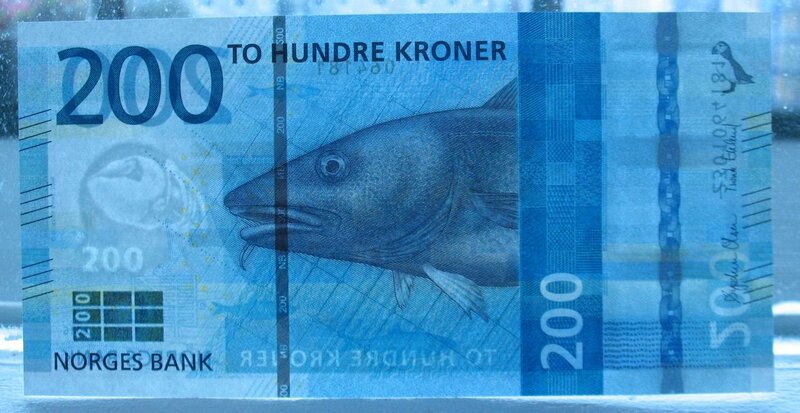 A banknote of 200 Kroner displays the theme "The sea that feeds us". On foreground is the Atlantic cod. The Atlantic cod (Gadus morhua) is a benthopelagic fish of the family Gadidae, widely consumed by humans. It is also commercially known as cod or codling. Dry cod may be prepared as unsalted stock-fish or as cured salt cod or clip-fish. It can grow to 2 meters in length and weigh up to 96 kilograms (212 lb.). It can live for 25 years and usually attains sexual maturity between ages two and four, but cod in the northeast Arctic can take as long as eight years to fully mature. Colouring is brown to green, with spots on the dorsal side, shading to silver ventrally. A stripe along its lateral line is clearly visible. Its habitat ranges from the shoreline down to the continental shelf. 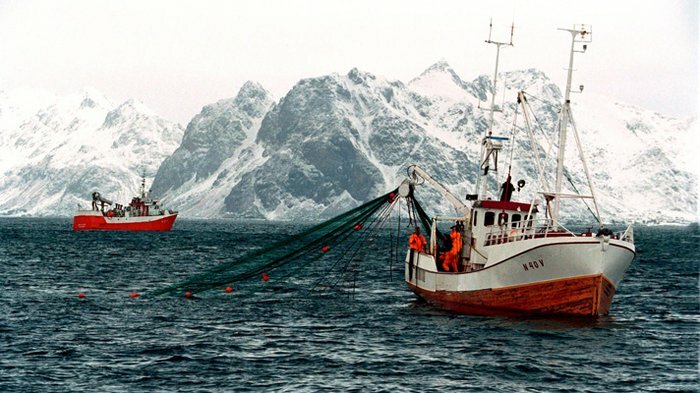 Several cod stocks collapsed in the 1990s (declined by >95% of maximum historical biomass) and have failed to recover even with the cessation of fishing. This absence of the apex predator has led to a trophic cascade in many areas. Many other cod stocks remain at risk. The Atlantic cod is labelled VU (vulnerable) on the IUCN Red List of Threatened Species. On background, 3 times, are depicted Atlantic herring. Atlantic herring (Clupea harengus) is a herring in the family Clupeidae. It is one of the most abundant fish species in the world. Atlantic herrings can be found on both sides of the Atlantic Ocean, congregating in large schools. They can grow up to 45 centimeters (18 in.) in length and weigh up to 1.1 kilograms (2.4 lb.). They feed on copepods, krill and small fish, while their natural predators are seals, whales, cod and other larger fish. 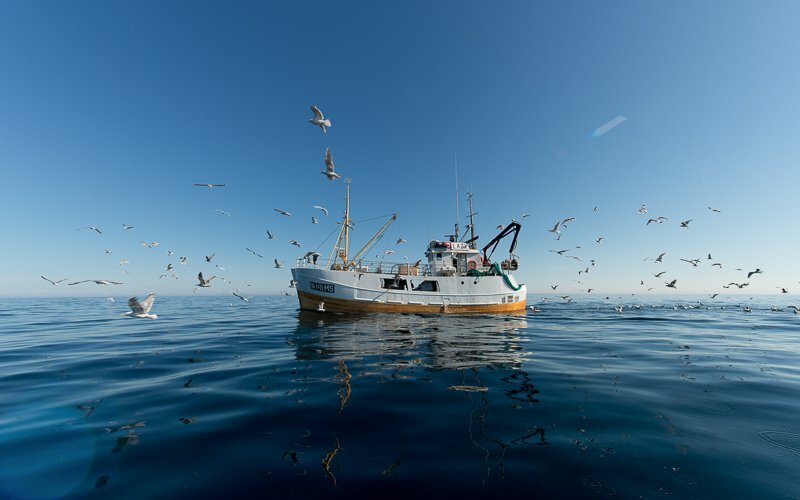 The Atlantic herring fishery has long been an important part of the economy of New England and the Canadian Maritime provinces. This is because the fish congregate relatively near to the coast in massive schools, notably in the cold waters of the semi-enclosed Gulf of Maine and Gulf of St. Lawrence. North Atlantic herring schools have been measured up to 4 cubic kilometers (0.96 cu. mi.) in size, containing an estimated 4 billion fish. On the banknote are shown The Atlantic puffin (three times) - in profile (in the upper right corner), flying - to the left of the center and with the fish in the beak - on the reverse. 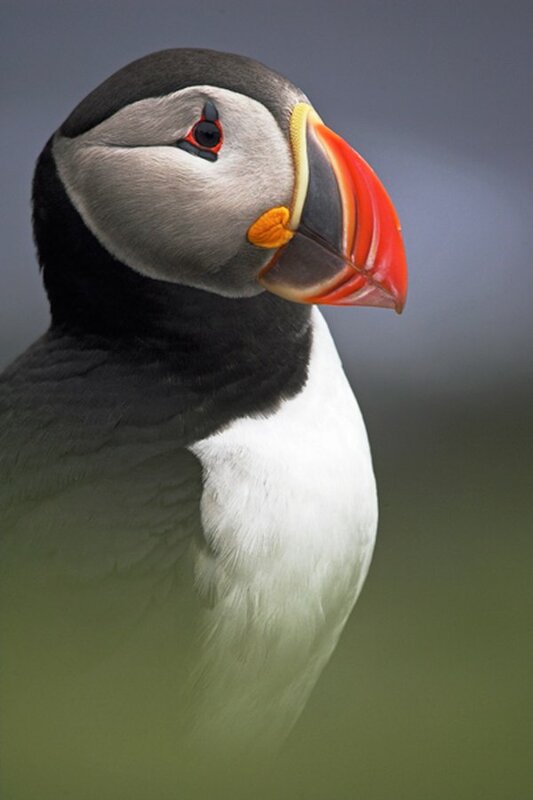 The Atlantic puffin (Fratercula arctica), also known as the common puffin, is a species of seabird in the auk family. 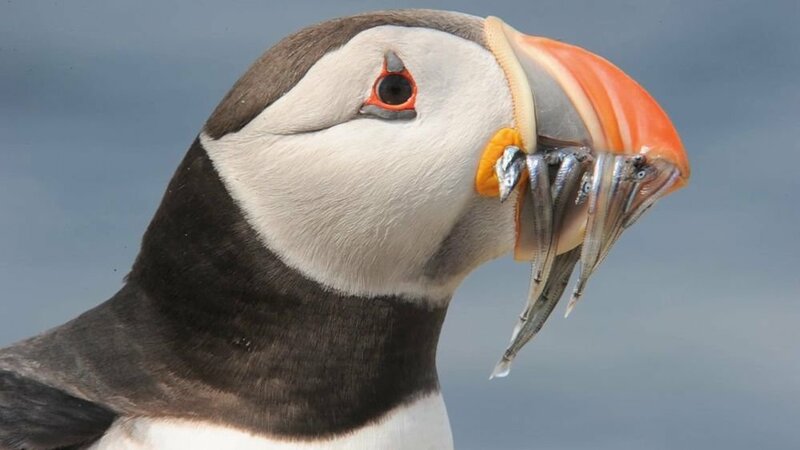 It is the only puffin native to the Atlantic Ocean; two related species, the tufted puffin and the horned puffin, are found in the northeastern Pacific. 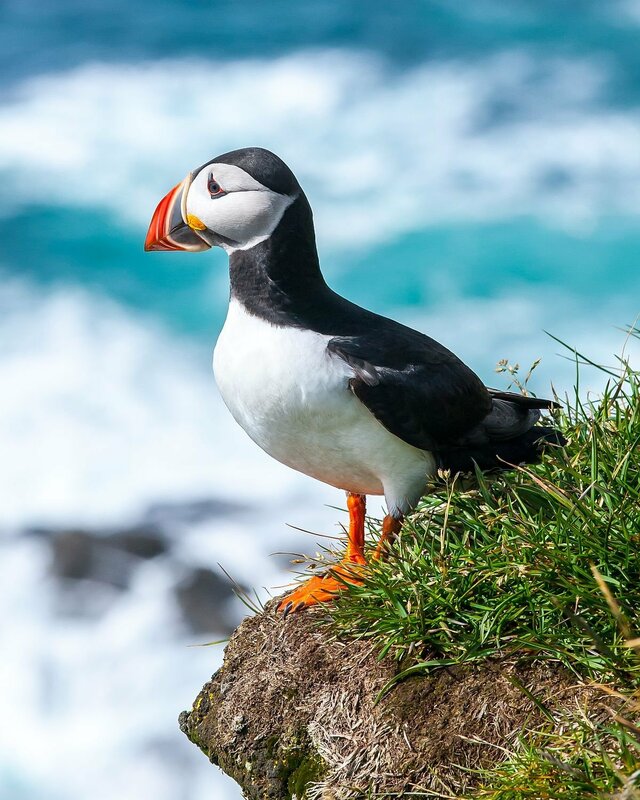 The Atlantic puffin breeds in Iceland, Norway, Greenland, Newfoundland and many North Atlantic islands, and as far south as Maine in the west and the British Isles in the east. Although it has a large population and a wide range, the species has declined rapidly, at least in parts of its range, resulting in it being rated as vulnerable by the IUCN. On land, it has the typical upright stance of an auk. At sea, it swims on the surface and feeds mainly on small fish, which it catches by diving underwater, using its wings for propulsion. This puffin has a black crown and back, pale grey cheek patches and white underparts. Its broad, boldly marked red and black beak and orange legs contrast with its plumage. It moults while at sea in the winter and some of the bright-coloured facial characteristics are lost. The external appearance of the adult male and female are identical except that the male is usually slightly larger. The juvenile has similar plumage but its cheek patches are dark grey. The juvenile does not have brightly coloured head ornamentation, its bill is less broad and is dark-grey with a yellowish-brown tip, and its legs and feet are also dark. Puffins from northern populations are typically larger than their counterparts in southern parts of the range. It is generally considered that these populations are different subspecies. 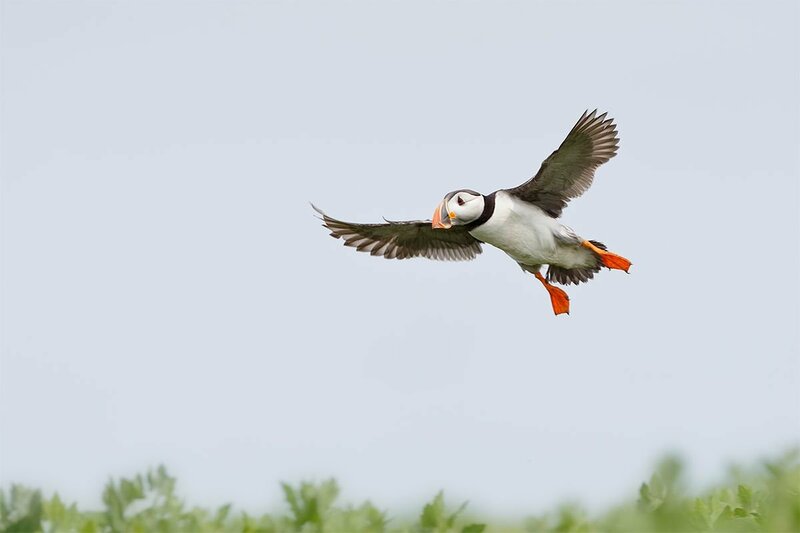 Spending the autumn and winter in the open ocean of the cold northern seas, the Atlantic puffin returns to coastal areas at the start of the breeding season in late spring. It nests in clifftop colonies, digging a burrow in which a single white egg is laid. The chick mostly feeds on whole fish and grows rapidly. After about six weeks it is fully fledged and makes its way at night to the sea. It swims away from the shore and does not return to land for several years. Colonies are mostly on islands where there are no terrestrial predators but adult birds and newly fledged chicks are at risk of attacks from the air by gulls and skuas. Sometimes a bird such as an Arctic skua will harass a puffin arriving with a beakful of fish, causing it to drop its catch. The striking appearance, large colourful bill, waddling gait and behaviour of this bird have given rise to nicknames such as "clown of the sea" and "sea parrot". It is the official bird symbol for the Canadian province of Newfoundland and Labrador. The background drawing shows mesh from a fishing net. Also - right of center - Signal flag: Letter N (Negative). Denominations in numerals are in top left corner and lower right. In words on top. Pixel motif on the horizon: Fishing boat. The designs are by The Metric System and Snøhetta and use an abstract geometric design influenced by the Beaufort scale. 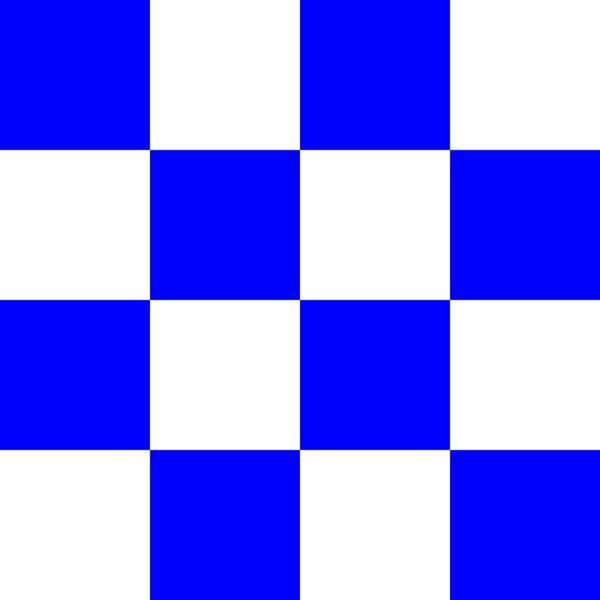 Cubic pattern: 8 m/s (flag and waves on fishnet background). Organic pattern: Gentle breeze. 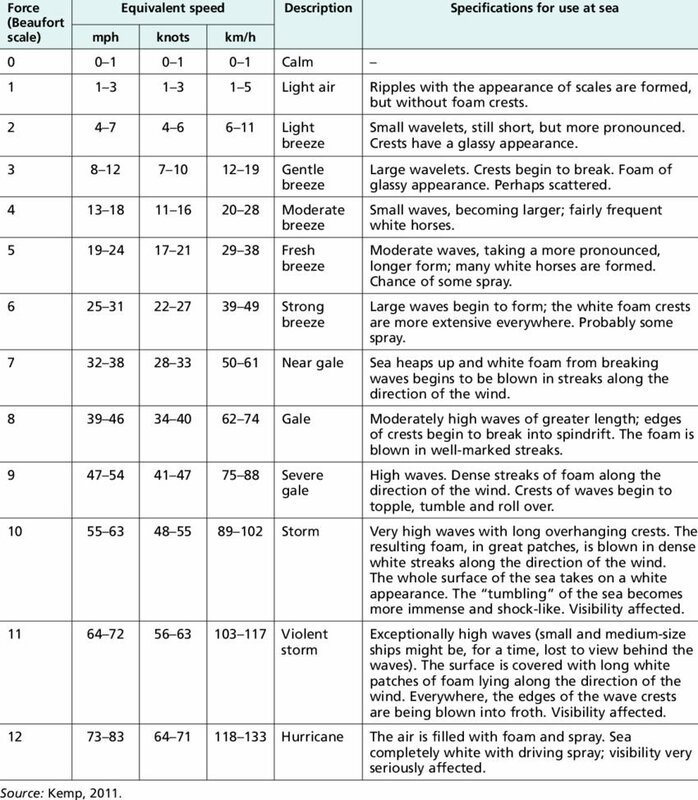 Wave heights of 1 meter or more (Beaufort scale - level 3). In lower right corner is the sea mark (Sjømerker) - a lateral mark indicating direction of buoyage. 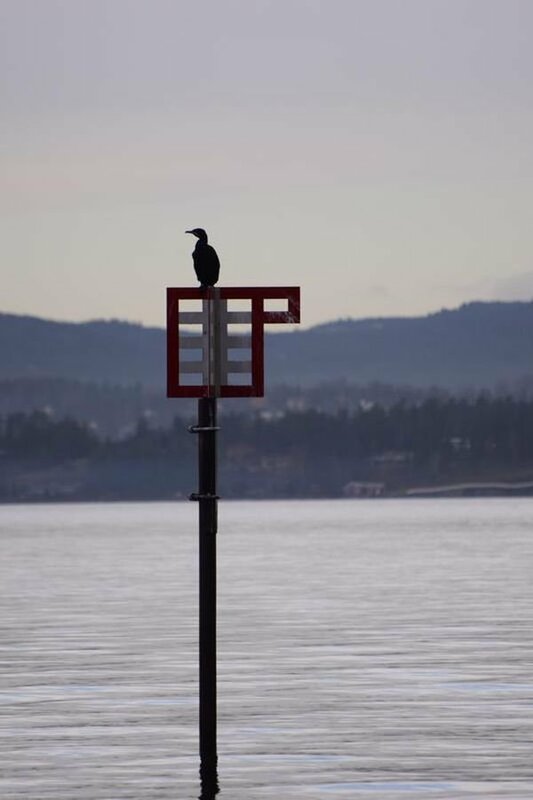 Along the Norwegian coast there are a number of daymarks that help seafarers navigate during daylight hours because it is difficult for those in unfamiliar waters to know which inlets are navigable. For visitors, the archipelago can seem like a maze, where an overview of waterways between shallows and reefs requires extensive experience and local knowledge. These lateral marks traditionally consist of a wooden grid on an iron pole mounted in the rock bed of a reef. The mark indicates the side of the shallows on which to navigate. Such sea marks can have one or more "flags" indicating direction of buoyage for a waterway. There are also traditional iron stakes without a grid or "flag" that indicates shallows or a reef that can be sailed around on several sides. In the 1800s, these stakes were often made of cast iron and had a diameter at the bottom of approximately 20 cm. To secure them to the rock bed, a deep hole of at least equal diameter had to be chiselled by hand. This was done manually by three men on a simple rig of pipes. Such work could only be done in calm weather. One man held the chisel, while the other two took turns swinging their sledgehammers. It is estimated that around 35 000 blows were needed to chisel a hole for such a stake. Landscape formations and characteristics and place names were originally used to navigate along the coast. Pilots and fishermen memorised these, or they compiled the information in books containing descriptions of the underwater landscape and waterways based on cross bearings and manual soundings taken using lead lines. The large number of sea marks contracted with the development of the network of lighthouses during the 1800s, when the government took overall responsibility for the establishment of aids to navigation along the coast. Some key sea marks were, however, already mentioned in the Sagas. The fact that very many of the burial mounds from the Bronze Age are situated near important coastal waterways is also indication that marking waterways past archipelagic islets and inlets goes far back in history. The location of inland burial mounds can often make much more sense when post-glacial rebound is considered. What were once historical waterways now appear as dry land because of the change in sea level. The motifs on all of the new banknote series denominations show the importance of the sea for the prosperity and welfare of the people of Norway. 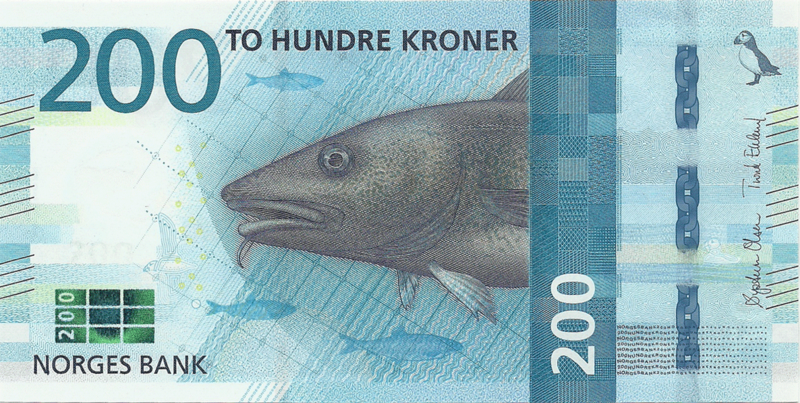 The primary motif on the front side of the 100-krone banknote is a Viking ship, while on the 200-krone note, a cod is portrayed facing left. On the back sides, abstract representations of a cargo ship (100-krone note) and a fishing boat (200-krone note) can be seen on the horizon. 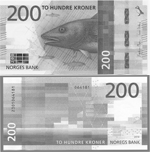 The banknotes were designed by Norges Bank's banknote designers Arild Yttri and Morten Johansen. 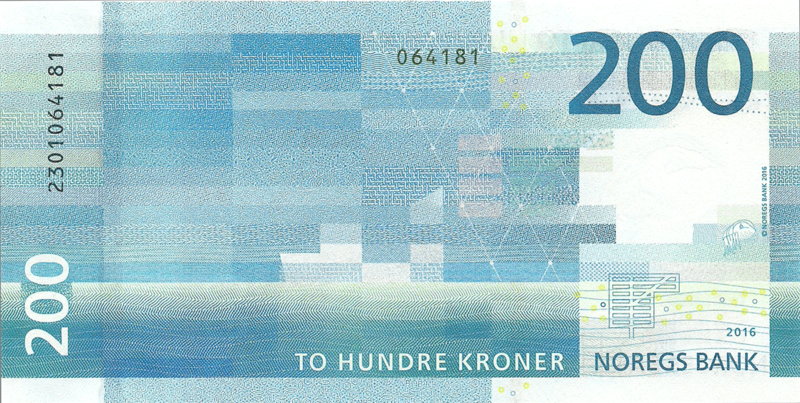 The designs on the front sides of the banknotes are based on the proposal from Metric Design and Terje Tønnessen. The proposals for the back of the notes were submitted by Snøhetta Design. The primary motifs were drawn by the artist Sverre Morken. The Atlantic puffin watermark motif is based on a photo taken by photographer Tom Schandy. The new 100-krone and 200-krone banknotes were printed by Oberthur Fiduciare in France. 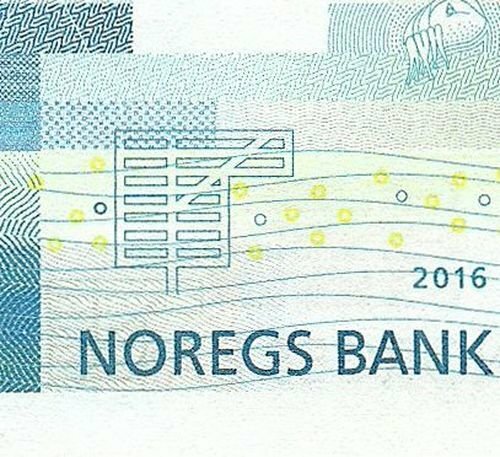 The official launch of the new banknotes will take place in Svolvær on 30 May 2017 at 2.00 p.m. From that time, the new 100- and 200-krone banknotes will be made available to banks at Norges Bank's central bank depots in Tromsø, Trondheim, Bergen, Stavanger and Oslo.